Mix and match 8 different animals and their professions with this fun and creative toy. Each character is split in to 3 chunky wooden magnetic pieces  displaying a head, torso, and legs. Children will love how the pieces connect magnetically and let them create their own mis-matched character with a unique outfit. The 3D pieces can stand on their own, or can be held, letting children create their own stories with these characters in any way they want. 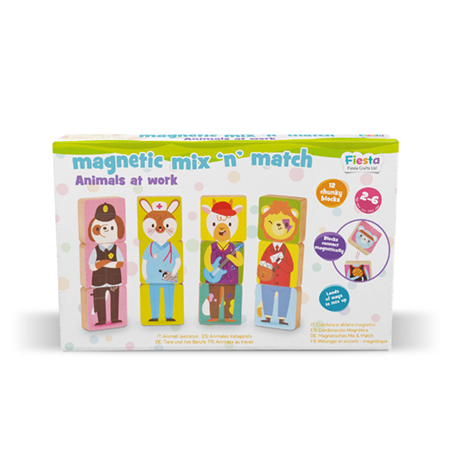 With over 100 combinations to put together this magnetic mix and match set will keep them entertained for hours!